Explore the potential of pharmacogenomics within drug discovery and development, thereby bringing safer, more effective medicines to patients. Promote a better public understanding of pharmacogenomic research and harmonization across the industry. Align activities with the programs and needs of Regulatory Agencies and policy-makers. The I-PWG Sample and Data CodingTask Force was initiated to assess current industry practices for DNA sample banking and sample/data coding, with the goal of developing recommendations for best practices in DNA sample/data storage, labeling, and privacy protection. A survey has been developed to gather information from I-PWG member and non-member companies on current practices, challenges, and added value of sample coding, de-identification, anonymization. 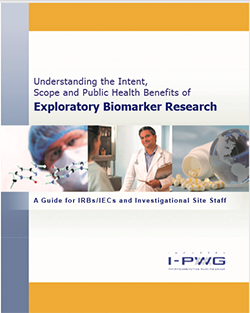 The I-PWG Global Sampling Harmonization Task Force was initiated to harmonize the application and format of industry pharmacogenomic studies and to encourage IRBs/IECs to support sample collections for genomic research. Goals include, identifying issues that regulatory bodies and IRBs/IECs find problematic with genomic sample collections, assisting with the interpretation of existing regulations, and using this information to improve the implementation of pharmacogenomic protocols on a global level. The I-PWG Education Task Force was initiated to develop educational materials for investigators and IRBs/IECs in order to optimize and streamline the implementation of pharmacogenomics in clinical trials. An informational brochure that will address frequently asked questions pertaining to pharmacogenomic research and sample collection, on a global level, is currently under development. The I-PWG Voluntary Genomic Data Submissions (VGDS) Task Force was initiated to prepare a joint publication between the I-PWG and the FDA on experiences with the VGDS since its implementation in 2005. The I-PWG Pharmacogenomic Study Design and Analysis Task Force was initiated to prepare an article discussing the practical design aspects and data analysis for pharmacogenomic studies. This information is intended to benefit the development of future regulatory guidances related to pharmacogenomic study design and analysis.